New books for sale soon! 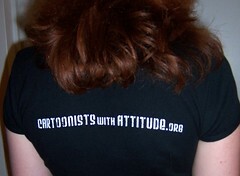 Get these awesome Cartoonists With Attitude T-shirts as worn by Masheka Wood and me (Mikhaela Reid). 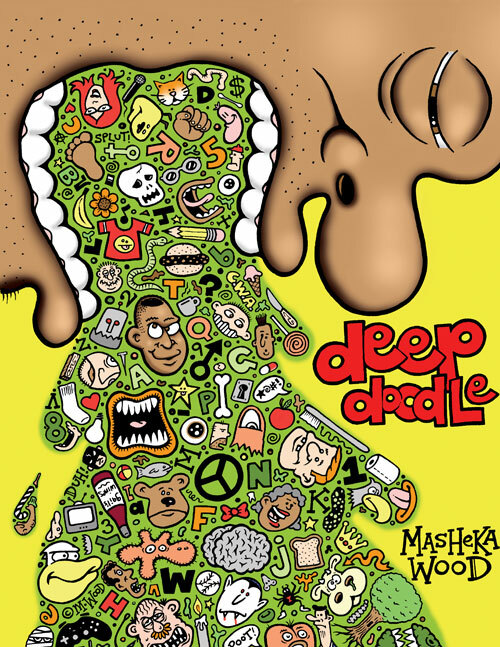 Show your love for the ink life and Cartoonists With Attitude artists like Ted Rall, Keith Knight , Matt Bors, Stephanie McMillan, Jen Sorensen, Brian McFadden, August Pollak, Masheka Wood, Shannon Wheeler, and yours truly. C.W.A. ink bottle logo on front, group name/site on back. 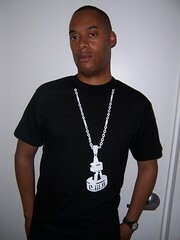 We have just a few of these high-quality white-ink-on-black shirts left, so place your order today! 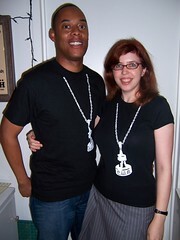 Men's shirts are Hanes Beefy Ts, women's shirts are Bella fitted baby-doll style shirts. 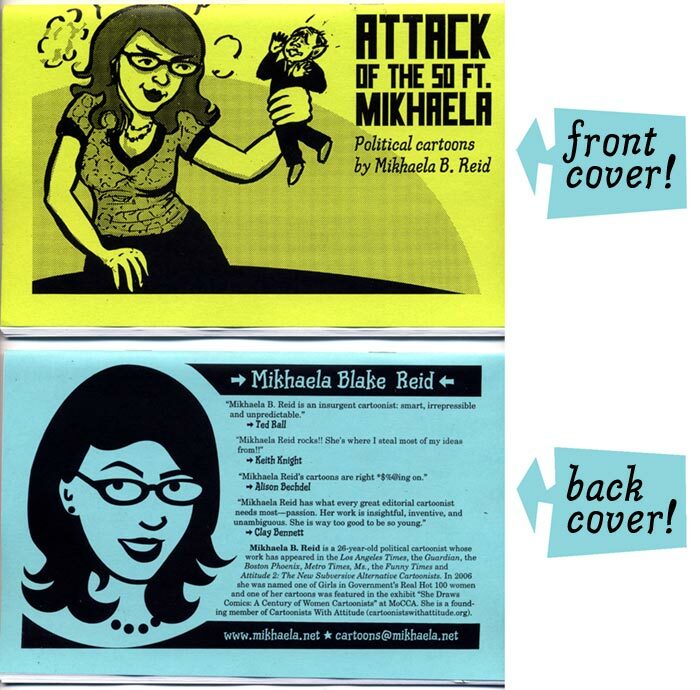 (If we're out of your size, you can also buy Attack of the 50-Foot Mikhaela black or white T's via CafePress in any size). 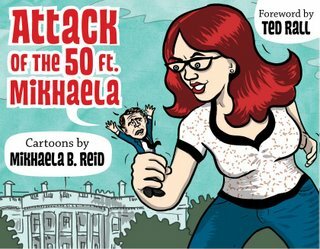 Attack of the 50-Foot Mikhaela (click to enlarge book image) is my fourth self-published cartoon collection, featuring 36 pages of my best cartoons. 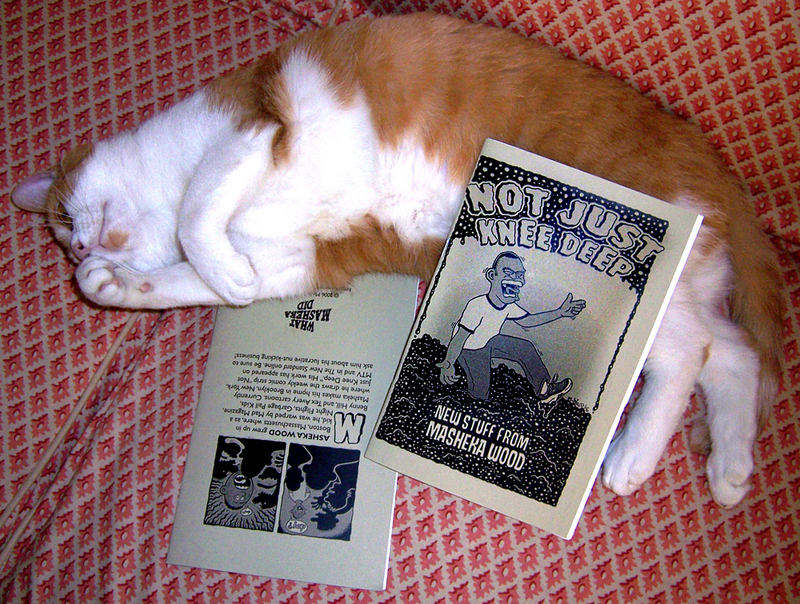 Available only from me--get your signed copies with cute little sketches while they last. Choose a blue or green cover (interior is black and white). Deranged cats love Not Just Knee Deep, Masheka Wood's second self-published cartoon collection Green cover (no more gray copies left). 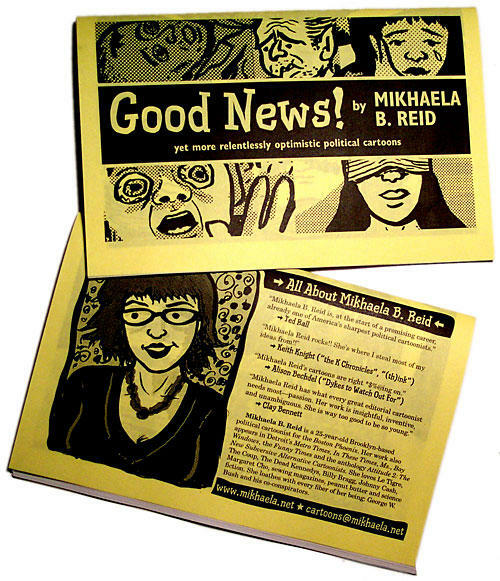 Good News (click to enlarge book image) is my third self-published cartoon collection, featuring 40 pages of my best cartoons from the 2004 and 2005 (from "Operation Heterosexual Freedom" to "Let Them Eat Toxic Sludge"). 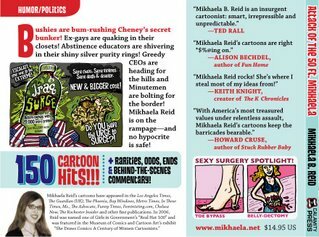 Available only from me--get your signed copies with cute little sketches of me or the guitar-playing vacationer-in-chief while they last. Yellow cover (interior is black and white). 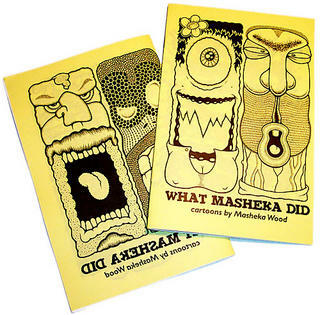 And while you're at it, why not buy a signed copy of Masheka's first ever cartoon collection, What Masheka Did, a 16-pager featuring strips (like "New Fall Shows" and "Duh vs. Doy!") and some gems and rarities from the Masheka archives not available online. (click above image for larger cover) I also still have one or two copies ofAtittude 2: The New Subversive Alternative Cartoonists, edited by Ted Rall. The work of 21 of America's smartest and funniest alternative weekly cartoonists is collected in this 2004 anthology, which features interviews with each artist, examples of their work, and personal ephemera never before published elsewhere. 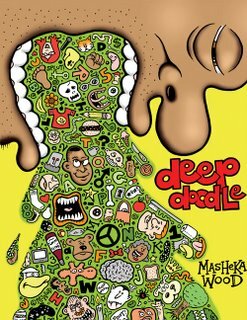 Includes cartoons by and interviews with Keith Knight, Alison Bechdel, David Rees, and Aaron McGruder (of Boondocks fame. Not to mention Barry Deutsch, Emily S. Flake, Marian Henley, Tim Kreider, Kevin Moore, Stephen Notley, Eric Orner, Mikhaela Blake Reid (yeah, that's me), Neil Swaab,Tak Toyoshima, Shannon Wheeler, Jennifer Berman, Max Cannon, Justin Jones, Greg Peters, Brian Sendelbach, Jason Yungbluth. Sadly, I can only sign for myself, but if you track these folks down I'm sure they'd be happy to add a drawing and signature. P.S.We can also sell you lovely high-quality limited edition color archival prints at 8 1/2 x 11" or 13" x 19" of any of our cartoons. Original cartoons also available from $100-$180 each. Email me for details. P.P.S. Please join or rejoin my mailing list! I just read that Giuliani is currently polling high as a 2008 Republican Presidential candidate. And then I threw up. Does NO ONE remember what this dude was like as NYC mayor pre-911? I haven't bought a single gift for anyone yet, but then again, I don't have any defeated Republican friends.